Includes laser-cut plywood centering rings and fins, plastic nose and tail-cone, 15" plastic parachute kit. There are two sets of fins line up on the rocket. This is a sport-scale model of the S25-Berkut which was part of the first operational Surface-To-Air missile system. Developed in the USSR in the 1950's, it was intended to defend Moscow from aerial attacks. 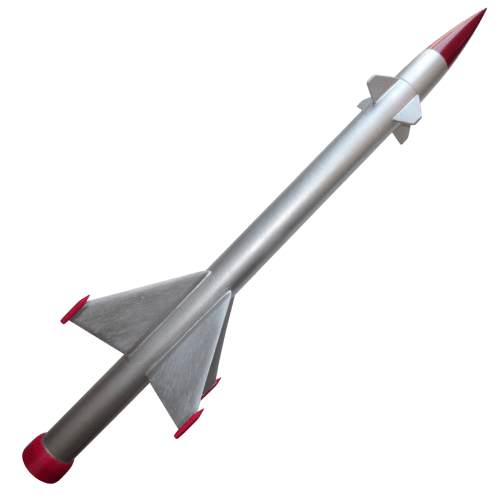 The S25-Berkut rocket kit includes color instructions, plastic nose cone and tail cone, fin toppers, laser-cut balsa fins, plywood centering rings, 15" plastic parachute kit. * Remove 2 sec using delay drilling tool from the 7 sec version of these reloads.